We love our readers. We respect the hard work of designers and developers across the globe. And we do our best to make the web design community stronger and the Web a little bit prettier. Therefore we ask talented artists and creative professionals to showcase their skills and release something unique and beautiful as a gift to the community. And when designers agree, truly impressive works see the light of day. A couple of weeks ago we released DelliStore, a professional CSS/(X)HTML-template with PSD-sources. In the poll and in the comments to this post our readers asked for more (X)HTML/CSS-template, so here are 6 more professional template that you can use without any restriction for your private or commerical projects. 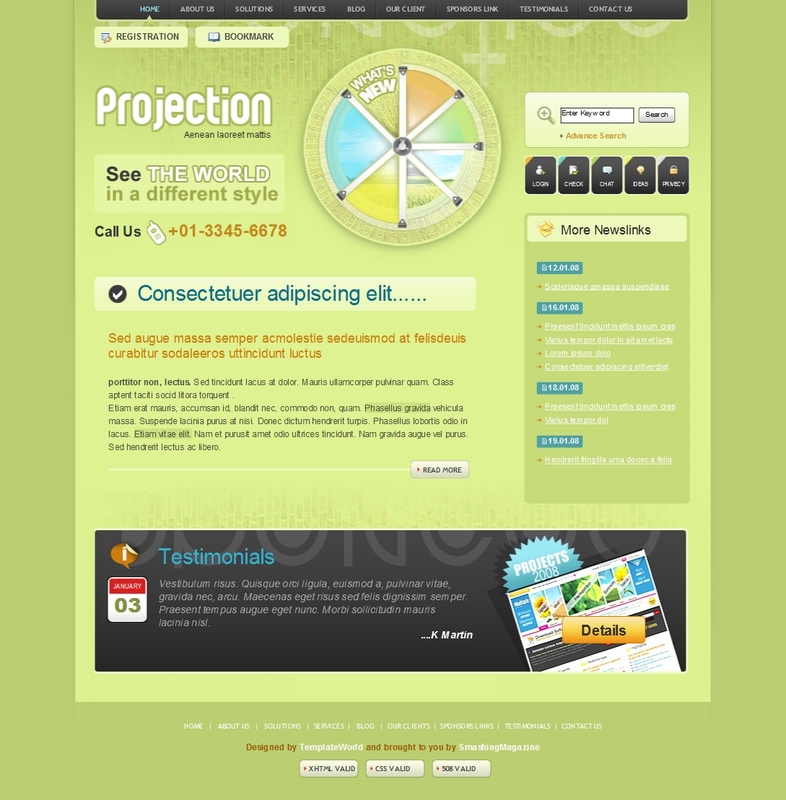 The template were designed by Templateworld and released for free especially for Smashing Magazine and its readers. We love our readers. We respect the hard work of designers and developers across the globe. And we do our best to make the web design community stronger and the Web a little bit prettier. Therefore we ask talented artists and creative professionals to showcase their skills and release something unique and beautiful as a gift to the community. And when designers agree, truly impressive works see the light of day. A couple of weeks ago we released DelliStore, a professional CSS/(X)HTML-template with PSD-sources. In the poll and in the comments to this post our readers asked for more (X)HTML/CSS-template, so here are 6 more professional template that you can use without any restriction for your private or commerical projects. 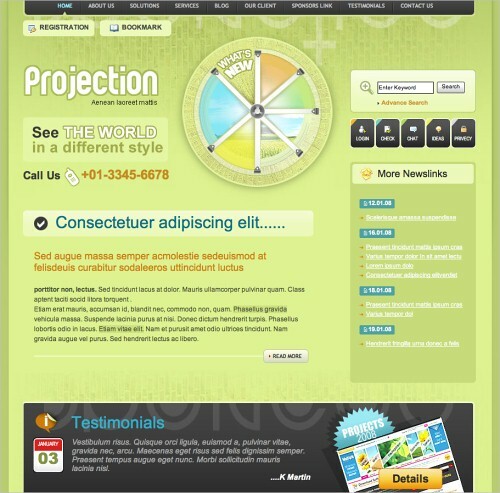 The template were designed by Templateworld and released for free especially for Smashing Magazine and its readers. Download and use the templates for free! The themes can be used and edited without any restrictions or limitations. 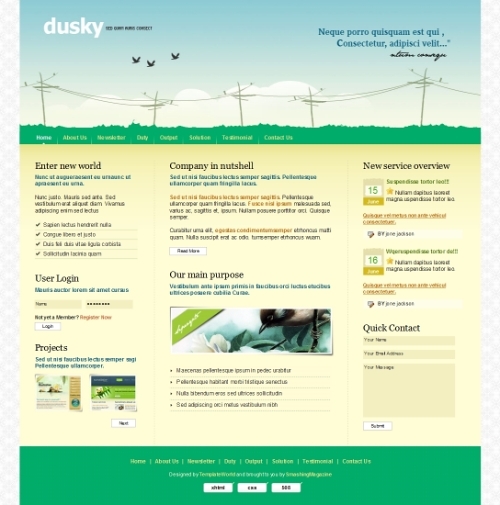 Feel free to modify the templates in private or commercial projects – the templates are absolutely free to use. From a long time we have been playing with the idea of creating a fusion design. Then we thought why not try a fusion between retro and contemporary design trends? Thus the ‘Shape’ template was born – an attempt to recreate the magic of the 70s while using a modern look. For this purpose we used typography and the Dahlia/Sunflower right in the centre to emphasize the retro look. The colour wheel behind the Dahlia/Sunflower is our view on changing times and colour preferences. Our love for nature shows through the entire design as we used a lot of green – in different shades, floral patterns and bamboo trees in the header. That’s with the design. Coming to the page elements, the header section shows links to 8 pages, a registration, login and bookmarking link. The header also has an integrated search feature. We wanted to have a distinct background colour for the company description and thus used black to make it look prominent. Then there is a news section, an awards column and a portfolio section. 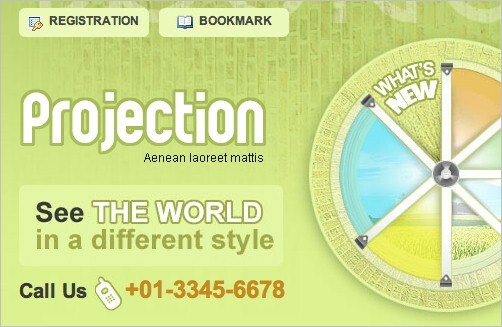 If you are one of those designers who have just too many designs to showcase, you can upload as many designs as you want as wehave provided a number of pages for it. The footer shows links to 8 pages. The template code is validated by W3C and also conforms to section 508 of the US Rehabilitation Act for Accessible design. This template incorporates the look and feel of graffiti art. You will see the header section with a wall as the background. We have used a bright shade of green as we wanted this template to exude a certain amount of freshness. If you are wondering what the wheel is all about, it’s a wheel of latest projects/services by the company. We have deliberately used a dark colour for the footer so as to make it conspicuous as it contains important information like latest projects worked on and the corresponding client testimonials. The template code is validated by W3C and also conforms to Section 508 of the US Rehabilitation Act for Accessible design. We have always seen the game of chess as a very powerful game which requires immense intelligence and presence of mind on the part of the players. These little figures, though inanimate, look very powerful and mysterious. We used their images for the template to represent their power and mystery. ‘Artificial Casting’ shows the chess pieces ‘Knight’ and ‘Bishop’ standing aloof to show their sophistication and a sense of mystery. Nature has always fascinated us with its attractive and vibrant colours. The natural colour of fruits and vegetables is where we drew inspiration for the design of this template. 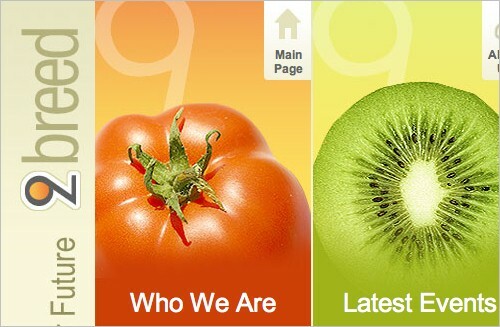 Therefore, you will see that we have used tomato and kiwi to give the template a natural feel. We have placed two of the main sections of the page – ‘Who We Are’ and ‘Latest Events’ on these to draw the reader’s attention to it instantaneously. The right navigation shows links to 8 pages. We have also placed a box advertising the latest jobs by the company. Then there is a section which shows links to the latest blog posts. The links have rollover effect. We have used separate boxes for Ideas, Sign-up and Blog so as it to give them distinctive. Just below that you will find a newsletter sign-up box through which readers can stay updated on the latest activities on the website and by the company. There is a Features section which enlists all the features of the services by the company. 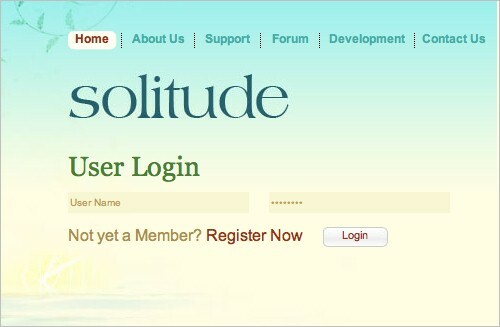 Beside that you will also find a Member Login box and a contact number for quick contact. 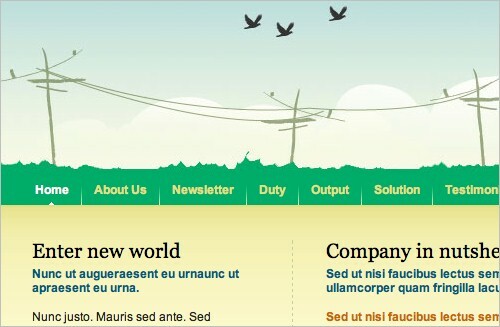 To balance the light colours usage, we have used a dark colour for the footer which shows 8 links. This template titled ‘Dusky’ is an illustration of the twilight which is our favourite time of the day. It is a time when the sky shows different hues of colour in a peaceful and serene setting. The sky bustling with chirping birds is also a treat to watch. We tried to replicate this beautiful part of the day in the template by using light shades of blue, green, and yellow and pictures of birds and sky. The left navigation of the body area shows a User Login box and a Portfolio of projects. The users can browse through all the projects by clicking on Next. The right navigation provides information about new services and a Quick Contact box wherein users can enter their name and email ID to contact instantly. The central area provides a brief overview of the company. In this hustle bustle of life, we are always surrounded by people and our responsibilities and often long for solitude. This template, titled ‘Solitude’ depicts this reality of life. Solitude or quiet time has often been regarded as a blessing as this is the time when we think deeply, feel rejuvenated, and have our minds brimming with bright new ideas. If you are thinking that I am taking you on a spiritual realm, you are right! This is our intention through the template titled ‘Solitude’. 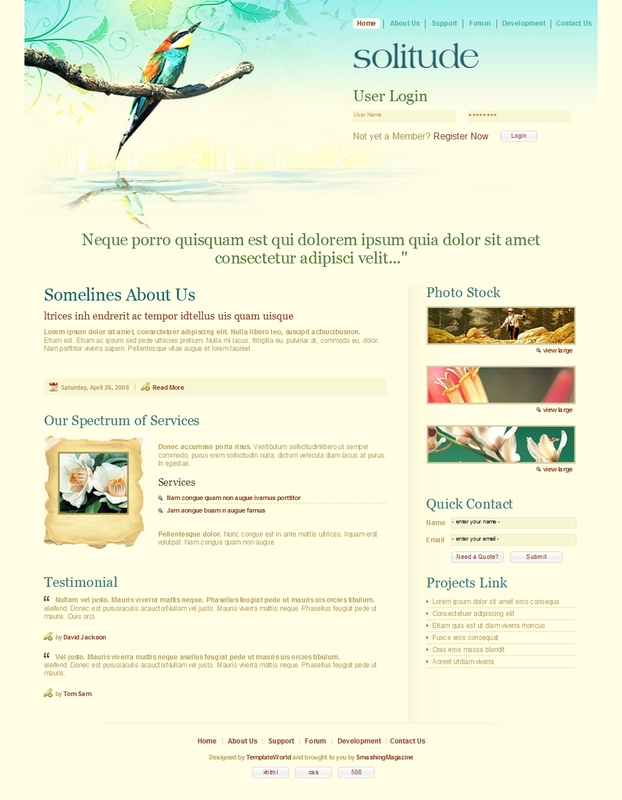 The header section shows a bird perched on a branch and looking upwards as if looking for inspiration. This is us, the designers who are always looking ahead for new ideas, inspiration and of course solitude! We used light colours and abstract art to complement the theme of the template. 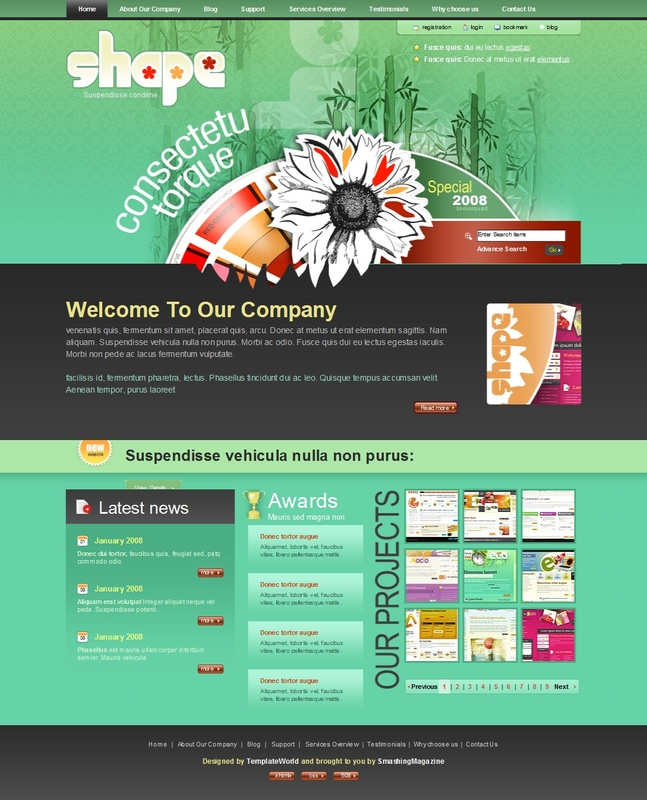 The body shows a short description of the company, the services provided, and a testimonial column. The services column also shows the related icon. The right navigation shows a preview of photos by the company, a Quick Contact box, and Links to Projects completed. live demoUnfortunately there’s no live demo anymore.